As many of us are well aware, Valerie Jarrett is one of President Barack Obama's senior advisors and most trusted confidantes. She's Assistant to the President for Engagement and Intergovernment Affairs, chair of the White House Council on Women and Girls and Co-Chair of the White House Task Force to Protect Students from Sexual Assault, but according to a maddening piece by Carol Felsenthal over at Politico, Jarrett is nothing more than a domineering earwig and that she would be much more useful as a librarian. In the piece titled "Fire Valerie Jarrett," Felsenthal argues that it's about damn time Obama drops his senior advisor because she is holding him back, NAY, completely isolating him from his helpless staff who tremble in fear of her and controlling his decisions. While it's not uncommon for a president to shake up his staff, particularly after such a devastating midterm election as the one that we witnessed last week, and and Jarrett's role seems to be up in the air, Felsenthal's line of reasoning is founded in second hand gossip and imbued with disdainful and sexist language. Weak. Check out some of these key points Felsenthal makes. If her role in this administration reflected reality, Jarrett would be called "First Big Sister" to both Michelle and Barack. 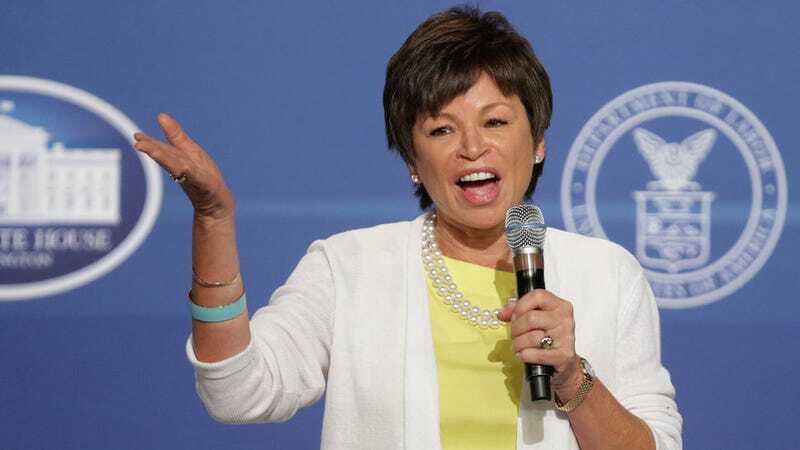 It's true that Jarrett was a family friend before Obama was even a senator, but with her resume I'd be willing to bet her proximity to the Obama family isn't the only thing keeping her around. For starters, even today, nobody knows precisely what Jarrett does in the White House. What exactly do her titles—senior advisor to the president, assistant to the president in charge of the Office of Intergovernmental Affairs, the Office of Public Engagement, the White House Council on Women and Girls—mean? Ah, yes, the "Does she even go here?" approach. All of them failed to persuade the president to nudge Jarrett out of the White House, Todd writes, because Jarrett held a "trump card" that the others did not—her close relationship with the first lady. Again, with the "family" connection. Jarrett micromanages guest lists for White House events big and small, hangs out in the private quarters and often joins the Obamas for dinner, says little in meetings, but walks out whispering in the president's ear and leaving nervous staffers in her wake, according to Alter. Guys, did you know Jarrett is actually the mother from The Manchurian Candidate? She keeps a Queen of Diamonds card on her at all times just in case Obama needs re-conditioning. Jarrett wields real power on personnel matters, but her choices often seem based on whom she particularly likes rather than who might be best suited for the job. She reportedly pushed the president to give a personal favorite, Eric Holder, the attorney general's job, then propped Holder up in the face of harsh (and, to the president, very damaging) criticism over controversies ranging from Holder's "nation of cowards" speech, which accused Americans of racism, to the "Fast and Furious" quasi-scandal involving questionable sting operations run by the Bureau of Alcohol, Tobacco and Firearms. Aha. Ahahahaha. AHAHAHAHAHAHAHAHA. Wow, first, Holder's "nation of cowards" speech happened in 2009, so that seems a little dated. Second, yeah, how dare Attorney General Eric Holder accuse Americans of being afraid to talk about race. Interestingly enough, Jarrett has been lauded for her commitment to amplifying the voices of White House staff members of color, which may have disrupted the status quo of white dudes talkin' politics, but for the better. Felsenthal's fundamental flaw here (one of several) seems to abide by the conservative wonk principal that people of color who have political power and talk about race problems are inherently extremists. Which, by the way, is racist. Felsenthal has absolutely zero intimate knowledge of having to fight tooth and nail for representation, and honestly the single line about Eric Holder's "nation of cowards" speech could actually retroactively inform the rest of the piece. She pulls from Glenn Thrush's e-book, a Daniel Klaidman book, and a New York Times Magazine profile, all published in 2012, refers to Mark Halperin and John Heilemann's 2013 book Game Change, and makes characterizations about things that Jonathan Alter supposedly told her that year. But she doesn't have anything fresh or original. There are no sources, quoted or unquoted, calling for Jarrett's head as a result of the midterm elections. The entire piece basically consists of Felsenthal quoting other people's insults which appear to be based on hearsay and then shrugging and saying, "Yo, I'm not the one who said it, but it's out there." And of course, Felsenthal's final remark, her oh-so-derisive proposal that Jarrett re-employ herself as the Obama's librarian is beyond moronic. It's not even edgy. It's more like a mental exercise in whether or not you can pity something that is so glaringly snide.